No, before we even start, this is not a blog post about the 4 Non Blondes album. This is a documentation of my mind numbing, soul destroying search for the best performing configuration with the hardware I have in my lab. I have spent countless hours / days / weeks building, breaking & rebuilding my VM Lab (thankfully I have an understanding wife & daughter). 2x HP Proliant N36L Microservers (Athlon II Neo Dual Core 1.3) (8GB RAM in one box / 2GB in the other). Add to this an assortment of older F5’s / dual P3 pizza boxes & other no name kit – and I have a playground full of toys. I have been using unRAID for the past few years on various hardware platforms. This has been mainly for storing media, ISO’s & providing a backup target for the various laptops & workstations around the house. Recently I picked up the two HP N36L Microservers, the 8GB one is my primary VMware ESXi 4.1 host and the 2GB server is running unRAID. Just having the second box sitting there running unRAID seems a little under-utilised to me, the disks are in standby most of the time (thanks to netflix) – and it just hasnt been getting the workout I think it deserves. 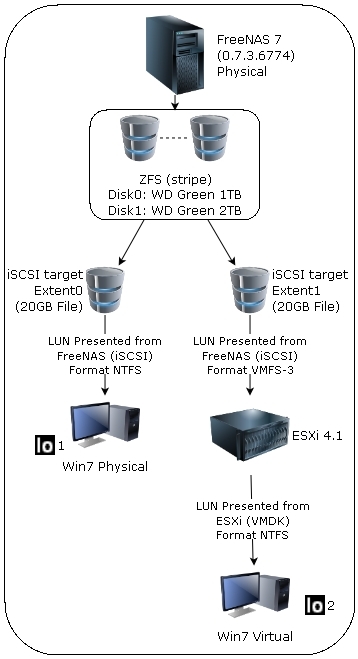 So – enter the newest project – whats the best solution for storing media / ISO’s / Backups / VMs etc – I want to be able to use either iSCSI or NFS to play with vMotion of VMs when I finish building my VMware test lab to finish my VCP – I want it fast, but I want it protected in case a disk fails. First I want to benchtest them for performance, then to setup the best solution that is a mix of performance & redundancy. Sounds impossible – im gonna try. I have mismatched sizes as thats the hardware I have free at the moment. If I find a compelling reason why this wont work, then I may get a second 2TB disk to match. 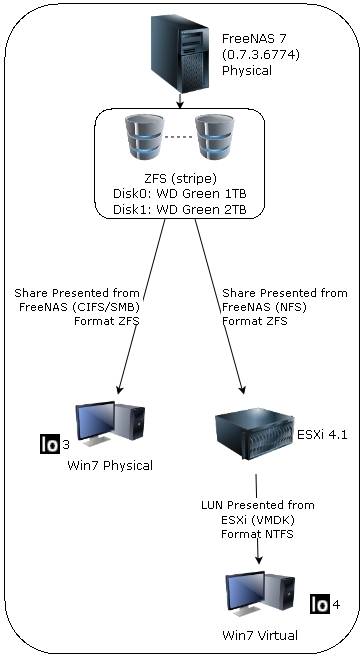 I am using WD Green disks for their low power / cooler running – comodity hardware. I will be adding follow up posts with the performance results, the PRO’s & CON’s (in my view) with each of these scenarios. Feel free to add comments & kick off discussions about this project.